Would You Buy 20 min Silent Vinyl? Discussion in 'Collector's & Listener's Corner' started by Rick-An Ordinary Fool, Mar 20, 2019. I think only the hipsters who meditate and read Mashable are into that sort of thing. Otherwise, why put wear on my stylus and vacuum tubes even spinning that thing? I have 12" singles from Casablanca that have a blank groove on the non-hit side. I don't know if it's an urban legend or not, but I've been told there was a 45-rpm record once called "Five Minutes of Silence" that was on a lot of jukeboxes, so frustrated rock'n'roll haters could get a break from the music in restaurants and bars. Was this a real thing? I never heard of it and didn't turn one up in a quick Discogs search but, I totally would believe it! I bet we could find it if we could find the specific title. Take a look at the listing--it's hilarious! The back cover of the jacket kind of hints as to what is inside. I would play my copy LOUD, as advertised. There are 170 backers at $4837.00 raised way over the goal. I find this so funny that people would back this. That's why I think only hipsters would "get it." But that kind of misses the point anyway, since they've moved onto the cassette--vinyl became too mainstream for them. Back in high school, I took a "Theory In Music" class where we had to compose a song and then orchestrate it. I did a real composition for the grade, but as a joke I wrote "The Quiet Symphony". It contained a multitude of rests, all scored out. My band teacher buddies would get a kick out of that one. Special Edition only--it featured "A Kind of Hush" as a bonus track. DeeInKY and Rudy like this. 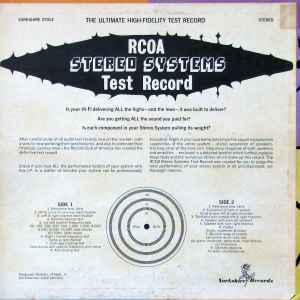 I used to have - may still have - the RCOA (Record Club Of America) test record. It contained a bunch of tones and bursts that were supposed to aid in turntable maintenance, and on one side there was a large gap with no grooves at all, just a smooth vinyl surface that was supposed to check your anti-skate settings. Needless to say, it was relatively silent. We had a "test record" on the London label that had a similar anti-skate section. I don't know what my dad thought he would find by using this on a Magnavox console. I have a different setup record that has specific tones to adjust anti-skating and other parameters, but it is anything but silent. And it was pressed on gold vinyl, since "Silence Is Golden"
Rick-An Ordinary Fool, Rudy and DeeInKY like this. I remember those test records. Everybody played them on the console. The Star Trek III LP had a whole 12-inch side of silence, after the disco version of STIII’s main title! Maybe it's a remix of the Miles Davis album, In A Silent Way, especially the first track: "Shh/Peaceful". This is so funny...play loud can be played with a sharp knitting tool. Some of you all's comments too are hilarious. They should have used color vinyl hinting at this "smooth color will enhance your listening experience"
I've never actually heard of this before but being truthful...it all "sounds" very intriguing...like I want to "hear" what this sounds like. Sometimes after a long day at work this could help me unwind. The best part is there is a hidden feature included with purchase. It's a bonus track, separated from the rest by about five minutes of silence. Just so you know it's not part of the main album. DeeInKY and Rick-An Ordinary Fool like this. I wonder if this thing is 33⅓ or 45 RPM? Or maybe they sell a version in each speed, as the 45 RPM would sound better.